All EIB investment projects are assessed for their contribution to addressing climate change and to achieving the EU’s targets for climate and energy by 2030. It has been estimated that meeting the climate change targets will require a total annual investment of EUR 100 billion by EU Member States. European Investment Bank, ‘Restoring EU competitiveness’ (2016 updated version). estimating and reporting on greenhouse gas emissions in all investment projects above certain thresholds. The carbon footprint methodologies the EIB has developed are publicly available on the Bank’s website.The EIB 2017 Carbon Footprint exercise estimates the GHG emissions from financing of investment projects at 4.6 Mt CO2-eq/annum, and carbon sequestration of 0.2 Mt CO2-eq/annum from forestry projects. Estimated savings from the same financing are 1.6 Mt CO2-eq/annum. As per all other EIB annual reports, these figures are subject to audit. The carbon footprint data of projects signed in 2017, both inside and outside the EU, can be found in the Bank’s Sustainability Report 2017. The EIB Climate Strategy was published in 2015, following which further efforts have been made to implement measures to reinforce the decarbonisationpathway of the European economy. In line with the strategy, the EIB is developing ways of targeting its lending at high impact climate action projects. Transitioning towards a low-carbon economy is not only a strategy to mitigate the potentially catastrophic effects of climate change. Emphasising the roles of renewable energy, energy efficiency and other low-carbon technologies, can spur innovation and create jobs. These activities and actions now involve a very significant, and growing, number of businesses and jobs in many EU countries. 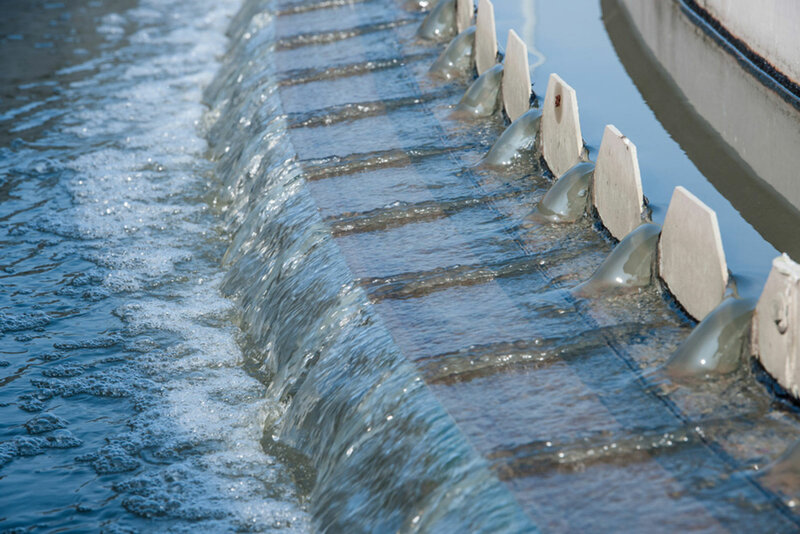 It is difficult to attract private sector investment in initiatives to combat climate change because of the long-term nature of the payback and the fact that the benefits may not be commercial in nature. Because of this market failure, the EIB has a key role in providing long-term finance for climate change actions. The Bank is committed to financing climate action investments that amount to at least 25% of total lending (EU and non-EU) across all its public policy areas. In 2017, 27% of the total EU signed volume of EUR 62.4 billion was dedicated to climate action. 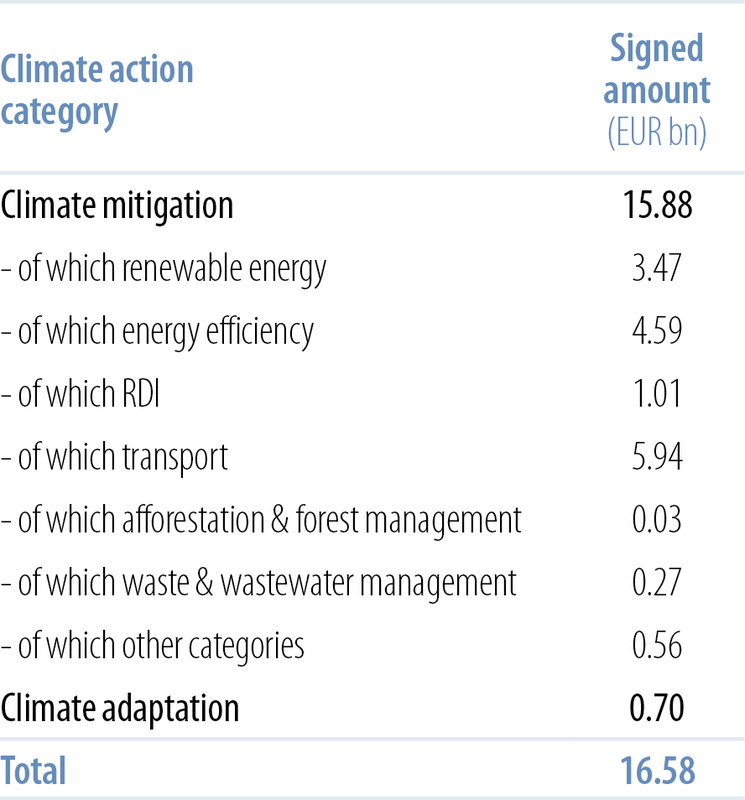 The table below details the amounts signed in 2017 within the EU by climate action category. Provisional, unaudited data based on 2017 EU signatures with EIB own resources.